Edie Evans is sick of being treated like a kid. And she doesn't-repeat doesn't-need a babysitter! And then along comes the strange, the shy, the captivating Alice B. Lovely. Suddenly Edie shakes off her cynicism, monosyllabic Stan gets giddy and giggly, and even Mum and Dad seem to relax once Alice is around, spinning her fabulous tales and coming up with left-field babysitting entertainment. But is Alice B. Lovely too good to be true? Karen McCombie is the author of many series that may be familiar to you, including the very popular Ally's World. This is a great book that will really suit 10+ girls who want a good pre-teen read, no boys, no drugs, no drinking, but there's still enough family drama and angst to keep them interested. Edie is angry. She is angry about being treated by a child, when she is 13 years old, she is angry about her parents divorce and she is angry with the sixth form girls at school who are BFP's (Big Fat Phoneys). There is even a list of 10 Things I Hate at the beginning of the book, This list includes things like BFP's, arguing, grown girls with teddies on their beds and the colour yellow! 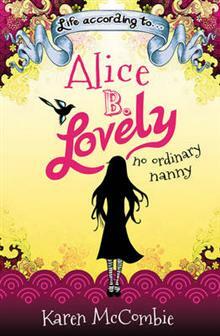 Just when Edie thinks she has managed to get rid of the last of the unnecessary nannies, Alice B Lovely comes into their lives. This new addition to her life does nothing for Edie's anger issues. Alice B Lovely is a doll like 16 year old whose wardrobe is quirky vintage cool, she changes her eye colour daily and she wears amazing false eyelashes, everyone falls in love with Alice B Lovely...except for Edie. Edie, as I mentioned, is already angry, so the fact that everyone in her family seems to think that Alice is wonderful, doesn't help with her mood, and she feels that she is being pushed out of her own family. The story is about Edie growing up, and letting go of the things that don't matter, as a result she finds that she can actually be happy. The story is also about art. Alice is very 'arty' and within the story we see how different people define art and the different and unique ways people create art.